I recently watched the Disney Pixar movie ‘A Bugs Life’ with my son and if you haven’t seen it yet (yes I know it has been out on video for a while now), it is very entertaining. 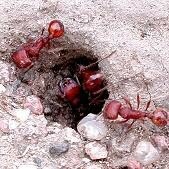 In the movie a colony of ants has to work to gather food for grasshoppers who act as bullies over the ants. During the course of the movie the head grasshopper says, “if the ants ever realize there are more of them then there are of us, the days will be gone when they stop collecting food for us.” I won’t give away the rest of the movie, but just know for now that there are more of them, ants, then there are of us. Ants may not be a common problem to many home vegetable gardeners, but it can be to some, and if not taken care of quickly the problem can escalate into a full garden infestation. With a little research and some help from our members on our vegetable gardening Facebook page we came up with three safe answers to this problem. Although not my first immediate choice, but apparently to some members in the group and confirmed by some research I did, many ant species will actually go to war with other ant colonies. The suggestion is to pick up some ants from one colony and place them on top of the other colony and vice-versa. The ants will go to war with one another killing each other off. This however is not a full proof method of actually getting rid of the ants as the “winner” will still be left behind and you will still need use on of the other two methods mentioned in a few moments. Feed the ants! What? You say! Apparently grits and cornmeal (I have used cornmeal in the past), when consumed by ants will make the ants swell because they can not digest the food even though they eat it anyway. This causes the ants to die. Both are good for the environment and safe for your garden, just not so safe for the ants. A quick Google search on “borax to kill ants” will give you plenty of recipes to use borax (boric acid) to kill ants. The ants take this stuff back to the colony and eventually will wipe the colony out. I read one recipe where you combine borax and cat food to attract the ants even better. I haven’t tried this method myself but from what I read it worked great and in a few weeks all of the ants were gone. The best part of these methods is that they are safe for your home vegetable garden. Because you are sprinkling the items on the colonies themselves or close to them, the ants do the work of bringing the deadly items back to their colonies themselves and keep it away from your plants. If you are having an issue with ants in your home vegetable garden, give these methods a try. Your ant worries will be gone in no time. Mike is the administrator for the largest vegetable gardening group on Facebook and the very popular Seeds of the Month Club. You can now join the Seeds of the Month Club risk-free. A very interesting post on our vegetable gardening Facebook page a few days ago got me thinking. See, I take most home vegetable gardening tricks and tips for granted because I have been doing it for so long. I am by no means the greatest to ever grow corn, but I can hold my own. So when Lisa posted the question, “Can I plant any variety of corn together?”, I had to step back and think for a second if that were possible. The answer in short is no as you will see when I get into the genetic classification parts. Corn has become such a mainstay in our very lives here in the United States and many other countries around the world. We use it for food, not for only ourselves but for livestock; some use it for fuel, while other companies use it to create corn syrup. It has a tremendous amount of benefits that go beyond spreading some butter on an ear and digging in at your yearly holiday barbecue. Let’s take a look at the genetic classifications of corn, so that the next time you plant it in your home vegetable garden you will increase your chances of a successful harvest. There are three main genetic classes for corn and they are (su), (se) and (sh). They represent normal sugary corn (su), sugary enhanced corn (se) and extra sweets or shrunken (sh). The corn you consume form your supermarket is more than likely the (su) variety. This type of corn tastes best if you can pick it and cook it the same day. 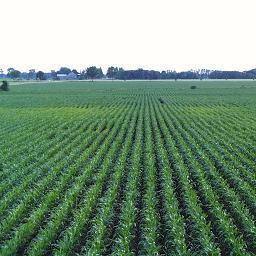 For best results you should avoid planting (su) near field corn. Sugary enhanced (se), has been genetically modified to increase the corn’s sugar content. It also retains moisture better which makes for a better tasting kernel. These varieties should also be planted away from field type corns. If you buy a sweet gene hybrid they are more than likely closely related to the (se) variety. The third classification, (sh), or shrunken, is super sweet. This is the corn type that has been genetically modified to raise the levels of complex sugars so their sweetness flavors will be increased. Moisture retention is much higher in the kernels of this corn which invariably gives the (sh) variety a tremendous shelf life. The (sh) variety should be isolated from ALL other types of corn in order to maintain their quality. What does isolation mean when it comes to making sure you do not mix and match corn types that should be away from one another? According to the USDA, “isolation can either mean at least 250 ft. apart, separated by an effective wind break, or 10 to 14 days difference in maturity because corn is wind pollinated.” Now that is a mouthful. Just plant like kind varieties together and you should be ok.
Now that you know the basics of what to look for when you buy your corn seeds (from us of course), follow the tips of the genetic classifications above and you will be well on your way to increasing your corn harvest. Last Thursday I posted a simple question on our vegetable gardening Facebook page. I asked, do you use one crop to support another in your home vegetable garden? The comments and feedback were tremendous. Many people use this simple technique to take advantage of the limited space that they have. Most home vegetable gardeners, me included, do not have the land size of what a traditional farmer would have; therefore we have to utilize what we do have. There are many methods you can go with such as vertical growing, crop succession and more. However, the one method I believe works best for everybody is the one I am going to talk about here and that is companion planting. Companion planting is the process by which you plant your fruits, vegetable or herbs close together because they compliment one another. For example, plant your corn twelve inches apart, but in between each corn plant, plant some peas, beans or other vegetable or fruit that is an indeterminate vine. Indeterminate simply means you do not know how long the vine or plant will grow. The peas or beans will latch on to the corn just as it would a trellis. There are a number of combinations you can go with such as planting carrots, a deep feeder, next to your tomatoes which is considered a shallow feeder. You can also take a plant that creates shade such as a sunflower and plant some spinach or lettuce underneath of it. There are entire books on the subject and combinations of good companion planting. You can also utilize companion planting to help with insect control. For instance aphids love to feed on tomato plants and ladybugs love to feed on aphids. Would it not make sense to plant something near your tomatoes that attract ladybugs to keep the aphids away? Of course it would and good plants to do that would be dill, fennel or cilantro. These three herbs serve more of a purpose here then to just be grown for consumption, they will actually aid in the maintenance of your garden by attracting beneficial insects. Remember not all insects are bad. In our earlier example of growing peas or beans alongside corn, I would recommend that you start the peas 3 to 5 days after you start the corn. Give the corn more time to get large before the peas or beans germinate. If you are going to go with a different indeterminate plant that grows as a vine, avoid ones that produce heavy fruit such as watermelon or pumpkins. You want the corn to have a companion, not a wrestling partner. Most seed companies will put on the back of their packets other vegetables, fruits or herbs that make for great companions. When in doubt, look there before you decide to go through a lengthy Google search. Just because you have limited space in your home vegetable garden, does not mean you have to limit what you grow. Take advantage of companion planting and the many benefits it has to offer and you will be well on your way to increasing the size of your harvest. On our vegetable gardening Facebook page, one of our members posted a great question and that was how they could compost without spending any, or very little, money. I gave it some thought and came to realize that how can anyone “spend” a lot of money on composting. To me, composting just by its name indicates free or near free. With help from some of our vegetable gardening members on our Facebook page I put together a few ideas that could help you build your compost pile and invariably improve your soil conditions for very low cost. Let’s start with the obvious choices and that is the organic material lying around your backyard. Do you or your neighbor mow the lawn and bag it up? Do you get leaves from trees in the autumn months? Did you or someone you know trim the hedges or cut the bushes down? If you can answer yes or maybe to any of these then you have everything you need for good compost. Simply take this material and put it in a pile in your yard, preferably towards the back of the yard away from your neighbor’s house. Periodically turn the pile over with a pitchfork to allow air in and move the freshly placed material toward the bottom and center. As “they” say, ‘wash, rinse, and repeat’. When was the last time you had a dinner that you just couldn’t finish, but it wasn’t quite enough to save what was left for leftovers? If your answer is, “oh yeah, that happens to me a lot”, then you are missing out on a tremendous opportunity to add compost to your garden soil. Using your trusty old pitchfork, dig a hole in your garden at least eighteen inches deep and put your leftovers in there. Fill the hole in with the dirt and you are done. The worms, bacteria and rest of the underlying ecosystem will feed on these leftovers and do all of the work for you. Again, “wash, rinse and repeat”. Did you know that Starbucks, the coffee house chain, has a program called grinds for the ground? They take their entire allotment of used coffee grinds and put them in a bucket, free for the taking. If you have a Starbucks near you or pass one on the way home from work, stop in as often as you can and grab some. 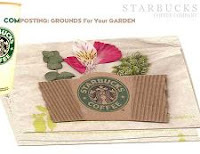 Coffee grounds make for great compost in your garden. Dump the coffee grinds in your soil and mix in with your pitchfork. Do you or someone you know like to fish? Fish waste makes for great composting. I heard a story one time how Native Americans would put one fish carcass below each corn seed to help with its growth. They were definitely onto something because fish waste is great. Next time you go fishing or filet your fish, save what is left and bury it in your soil. The ecosystem will do the rest for you. As you can see all of these methods are great ways to save some money with virtually free composting. If you are willing to put in a little elbow grease, you can create great compost for your garden soil all year round. If a rose by any other name is still a rose, then a tomato by any other botanical classification is still a vegetable. Scientifically the tomato is classified as a fruit, but we, as home vegetable gardeners, will forever refer to this great tasting item as a vegetable. The tomato is so popular in the home vegetable garden that it nearly doubles the next most popular item, the cucumber. Tomatoes are extremely popular because they have so many uses when it comes to eating them. You can add them to salads, soups, make sauces and stews out of them or simply slice them up and add them to a sandwich. In spite of their popularity many home vegetable gardeners neglect the basics which could help them increase their harvest and grow tastier tomatoes. Here are some basic growing facts to keep in mind when you start your tomatoes. Here in New Jersey my “drop into the ground” date for tomatoes is June first. Some people start earlier, but I want to make sure there is absolutely no chance of frost. Frost will destroy your tomatoes. In order for you to take advantage of planting on your “drop into the ground date”, start the tomatoes indoors. Tomatoes are one of the best vegetables to start indoors. As long as they receive plenty of sun, and a constant warm temperature, they will grow well. I give my tomato plants six weeks of indoor time before I take them outdoors. This ensures that they are a larger, sturdier and healthier plant, which increases their chance for survival. There are some genetically engineered tomato plants out there that will tolerate partial sun, but where is the fun in that? If you choose a typical tomato plant then it will require full sun. That means sun from the time the sun rises until it sets in the evening. Do not pick a spot in your yard; porch or balcony that only receives a little bit of sun. You will really put a damper on your tomato harvest. The bottom most leaves of your tomato plants really serves no purpose once they, your tomato plants, grow to be a foot and a half to two feet tall. They simply use up nutrients that could otherwise be going to parts of the plant that really need it. Once your tomato plants reach the height previously mentioned, remove the bottom leaves. Use a pair of scissors to cut them off by the stem. Tomato plants have weak stems and although you could just let them fall over and grow that way, by doing this you increase the chance that the tomatoes will develop blossom end rot. Invest in some tomato cages, tomato stakes or build your own contraption where you can prop up your tomato plants and keep them off of the ground. Chances are you are like the other 74% of home vegetable gardeners in the world and you will have one or two tomato plants growing this season. Give your tomato plants every chance possible to produce for you plenty of fruit by following these tips. You know the old saying, take care of them, and they will take care of you. Mike is the administrator for the largest vegetable gardening group on Facebook and the Seeds of the Month Club. You can now join the Seeds of the Month Club risk-free for three months. When was the last time you walked into your local grocery store or supermarket and headed directly for the produce section? Chances are it is every time you go right? As much as we, home vegetable gardeners, would love to grow everything we need to survive, there is always something that we will still need to pick up. Let’s say that the item in question for our example here is black beauty eggplant. When you walked into the produce section to go pick some up, did you buy thirty of them at once? No of course you didn’t that would be ridiculous! I am going to get into a little technique in a moment that covers this, but for now understand that buying this many of one type of vegetable all at once is impractical. Why then, on the back of most seed packets do you think they, the seed packagers, want you to plant all of the seeds at one time? An even better question is why they have you plant 3 to 4 seeds in one location and then thin out the pack so to speak. In other words, spread them out. Did you know some varieties of vegetable seeds come nearly 1000 to a pack? That is a whole lot of lettuce to grow at one time. This method of gardening has been passed down from generation to generation and although it doesn’t make it wrong to still do, it creates more work for you then is necessary. Also, you grow more food than you need. Here are some tips you can implement in your home vegetable garden, to use less space, grow the right amount of food, and use less seeds. On the back of your zucchini packet it will say to space your zucchini out thirty-six inches. So how wide of a row do you think you will need? Thirty-six inches right? You can maximize your garden space by making rows the width of what you exactly need. If a plant calls for twelve inches, make your row twelve inches and not any more. The only space you will need in between the rows in your home vegetable garden should be the size it takes you to walk between them. If you need a twelve inch row then the next plant of the same or even a different variety should be no closer than twelve inches correct? So make sure you space out your vegetables properly. If you need twelve, make it twelve, not sixteen or twenty. If you are doing that you are wasting space, and creating room for weeds to grow. Invest in a ruler or tape measure if you have to, but make sure you space those seeds out properly to use only the soil you actually need. Going back to our eggplant example, you do not buy all thirty of them at once so why would you plant all of the seeds at one time. 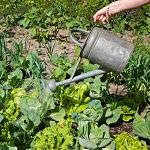 Stagger your plantings of vegetables of the same variety. 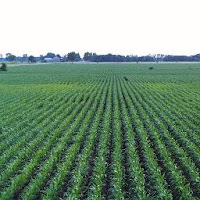 For example, I like to plant three rows of corn every 4 to 7 days (depending on the weather) so that I have a steady supply of corn throughout the growing season. I use this same technique for all of my other vegetables as well. Using these three tips above will help you use less of your seeds at one time, utilize more of your ground, and create less work because you will minimize the amount of weeds your home vegetable garden will grow. Give them a try. You won’t be disappointed. Mike is the author of the book ”Vegetable Gardening for the Average Person” and the administrator for the largest vegetable gardening group on Facebook. You can now join the Seeds of the Month Club risk-free for three months. In our last article and podcast we talked about insects that were beneficial to your home vegetable garden. Unfortunately not all insects are good, in fact most are bad. They will eat your vegetables, destroy the stems, tear up the leaves and even worse, bore themselves into the plants you are trying to grow. You can arm yourself to protect your garden if you can identify them and come up with a remedy before the harmful insect problem turns into a complete infestation. Here are four common harmful insects that you will encounter in most home vegetable gardens. These bugs are the most common and with good reason. They eat everything! Nothing is immune from an aphid. They come in a wide range of colors and sizes but are in large part all shaped the same, sort of pear-like. Aphids will form their population on one plant and when that population increases in size to the point where the plant is overwhelmed with them, some of the aphids will form wings and fly off to the next plant where the process starts over. As you can see if you do not take the necessary steps early enough, you could have an infestation. Use yellow sticky traps and neem oil for immediate solutions, but if you want a long term solution start attracting ladybugs. They eat aphids! They will affect mostly your corn and tomato crops as well as a few other vegetables, but they can do a tremendous amount of damage. They are about an inch long and are usually green to brown in color with dark stripes. They feed on stems, leaves and the fruit of your plants. They don’t spread as fast as aphids, but can do equal damage. Immediate solutions include a Btb spray, and for long term get some Trichogramma wasps in your garden as soon as possible. Cucumbers, melons and squash are three of the many plants that these pesky critters will go after if you do not take care of them early enough. They are only about a ¼” in size, but they can wreak a tremendous amount of havoc on your home vegetable garden. They have yellow wings with black spots or stripes and their larvae are whitish grubs. An immediate solution is to spray with neem oil soap, however, if you want to get rid of them, you need to start by destroying the larvae in the ground. Milky spores and beneficial nematodes will do the trick. Visit your local garden center or co-op for more information. Tomatoes and cucumbers are the two most popular items that people grow in the home vegetable garden and therefore white flies are well known to many. They love to feed on these two plants, among others, so if you aren’t careful, you will become a victim to them. They are very tiny and as their name implies, they are white in color. Using yellow sticky traps will help immediately as will a garlic spray, insecticidal soap and neem oil. For long term prevention, attract ladybugs and lacewings to your garden. They will feed on the white fly. To better protect your fruits and vegetables in your garden from harmful insects, it is best to know what they are so you can plan out your attack and prevention. These are just 4 of the many you will encounter. Take the necessary steps to start protecting your harvest today. Do you have a home vegetable garden? Do you know which insects you should try to get rid of and which you should leave alone? These are very common questions on our Vegetable Gardening Facebook page. If you do not know the answer that’s ok, it is not so common knowledge. You should, however, familiarize yourself with some of the more common insects so you don’t accidentally eliminate them from your garden. Here are four to get you started. A Google image search will give you a picture of what they look like. They are about a half inch long and are quite ugly to tell you the truth. In fact they look almost like a half spider, half cockroach and can easily be confused as a harmful insect. They are anything but! These creatures eat a variety of harmful insects from beetles to earworms to white flies. 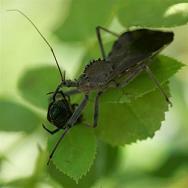 Have a few assassin bugs in your garden, and they will work harder for you then any type of bug killer and will not harm any of your vegetable plants either. What is more delicate, gentle looking and beautiful in the insect world then the ladybug? But did you know that the ladybug is one of your greatest allies in your fight against such harmful insects like the potato beetle, mites and soft bodied insects? Adult ladybugs can eat their weight daily in aphids, which is a good thing since aphids can ruin your entire crop. To attract ladybugs to your garden plant some fennel or cilantro. You can even build a ladybug house. Do a Google search on “ladybug house” and you will get thousands of results for plans to build one yourself. Back when I was a kid there was a rumor that is was bad luck to kill a praying mantid. Who knows, maybe it was true because as I found out later in life, when it comes to warding off harmful insects, the praying mantid is pretty good at it. The only problem with the praying mantid is that it eats all bugs, with the exception of the ladybug. So whereas they will eat harmful insects, they will also eat your beneficial ones as well. This defines a group of parasitic wasps. The wasp itself feeds on nectar but they lay their eggs inside garden pests so their young have a food supply. Sounds like a wild sci-fi film doesn’t it? Luckily these wasps use insects such as earworms, cutworms and other vegetable borers as the host, all insects that would wipe out your crop in no time. Many home vegetable gardeners, especially those new to the hobby, never think about bugs that could actually help them. They just assume all bugs are bad and they must be killed. These are just 4 of the literally thousands of beneficial insects that are there to help you have the best home vegetable garden.